On behalf of the Council of the American Society of Nephrology (ASN), I welcome you to Miami Beach and the 32nd annual meeting of the Society, the last meeting of this millennium. I have been honored to serve as President of your Society over the past year and have felt a special responsibility, because I represent the first member of the Council, and thus the presidency, elected by peers. Before I go further I would like to express my debt of gratitude to the ASN staff led by its executive director, Sherri Mara, and to my assistant, Margaret Marksthaler. Without their intense, tireless efforts, this meeting would simply not have happened. Then I would like to recognize the 1999 Program Committee (Table 1). The dazzling science, both clinical and basic, that is being presented is largely the result of their incredible hard work and effort. Their chair, Tom Coffman, has done an absolutely fabulous job. When considering the awesome task of saying something meaningful to your respected colleagues and esteemed scientists, I took solace in the words of Abraham Lincoln in the Gettysburg Address when he said, “The world will little note nor long remember what we say here.” He went on to say though that he hoped that people would remember what transpired at Gettysburg. I hope the same is true of the 1999 American Society of Nephrology Meeting. As one reflects on the upcoming century and looks back over the last one, the advances in our discipline have been truly remarkable. When I think of nephrology as it was 35 years ago when I began, there are stark contrasts with today. The standard hemodialysis procedure used two dialyzers for different patients and the same dialysate bath. Obviously, this was before there was any knowledge of infectious diseases such as hepatitis B, hepatitis C, and HIV. The standard hematocrit for patients on dialysis was in the low 20s. Many of the symptoms we attributed to uremia have been eliminated by the startling discovery, development, and routine use of erythropoietin. There were no computers. When scientific manuscripts were typed, carbon paper was used and if a mistake was made, retyping was required. Molecular biology and genetics were considered subjects of little clinical relevance, but now the genes have been identified and cloned for polycystic kidney disease and a growing array of renal disorders. This puts the pathophysiology of disease at a molecular level with obvious exciting therapeutic implications. Renal transplantation when it worked was considered a miracle; now, when it does not, there is much soul searching. There were intense debates about whether diabetic patients with end-stage renal failure (ESRF) should even be offered renal replacement therapy with the predominant feeling that they should not. There were committees that decided who would live and who would die for want of available ESRF treatment resources. Rationing of care was explicit. Such factors as divorce, diabetes, and lupus were all points against you. To put medical progress in perspective, one need only look at the marked decrease in the past 40 years of age-adjusted mortality in the United States. Although most of our patients still die of cardiovascular disease, the drop in death rates from these causes has plummeted markedly, in my view largely due to advances in medical care including importantly the treatment of hypertension. Thus, as we look ahead, the members of the American Society of Nephrology and the entire nephrology community can be proud of their scientific and professional achievements on behalf of the patients we all serve. The future scientifically is simply dazzling and the possibilities are unlimited. Yet as I look ahead, my enthusiasm is somewhat muted by two problems potentially immense in their implications, which are as yet unsolved and perhaps even unrecognized by many. These are the increasing role of industry and economics in nephrology and the diminishing pool of physician-scientists. Let me address them now. Largely because of economic considerations, there has been a marked change in the delivery of health care. Under the rubric of saving money and “population medicine,” the landscape has changed. Physicians are no longer considered by the public and perhaps even by themselves as advocates for their own patients. The governor of my state of Oregon, himself a physician, stated publicly that the “Hippocratic Oath was outdated for the 20th century.” He used this as a justification for the Oregon Health Plan of expanding Medicaid eligibility to more individuals in the population by the technique of reducing services to sick patients so that the program would be budget neutral. A ranked priority list of diagnoses and treatments despite a lack of factual basis was created with these coverage decisions to be explained to the patients by the doctor. Patients were rapidly transferred into managed care arrangements even though they were a Medicaid population with the typical health profile of that population. A Harris poll shows what these patients thought versus what is written in the managed care satisfaction surveys you read in the marketing propaganda (Figure 1). Few in the profession stood up against the questionable ethics of these marked changes in the doctor-patient relationship. The Oregon program is a financial disaster, as judged even by its most ardent supporters with large amounts of new money required to cover the bureaucracy and even the basic medical services for this population. More importantly, the program has further served to discriminate against the fastest growing minority group with whom we as nephrologists interact, namely, the seriously ill. In my view, the profession may be close to giving up its birthright, which is the traditional doctor-patient relationship. Everything now seems to be driven by the unproven idea and perception that the primary goal of the health care enterprise is to save money by health maintenance. The sick are considered failures. Physicians, to many, are little more than interchangeable technicians whose services are bought and traded like other commodities. 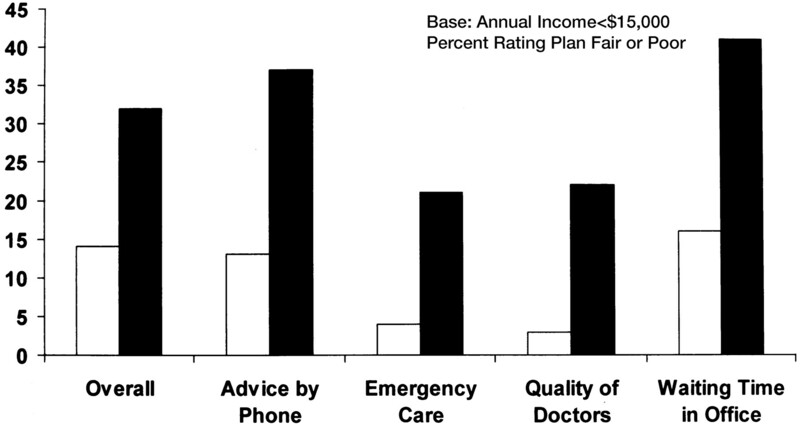 Experiences of low-income individuals in managed care arrangements. Managed care members (▪) expressed lower levels of satisfaction than those using fee-for-service (□). Data are from The Commonwealth Fund Managed Care Survey, 1994 (Louis Harris & Associates, Inc.). In nephrology, the industrialization and incorporation of the practice of medicine has been dramatic. Wall Street, not Main Street, controls health care. Inevitable forces that flow from this process have rapidly changed the face of the profession. Firms with anonymous shareholders are interested in the price per share, not necessarily the long-term health of the company or health care enterprise. To quote the Nobel economist Milton Friedman (1), “Few trends could so thoroughly undermine the very foundations of our free society as the acceptance by corporate officials of a social responsibility other than to make as much money for their stockholders as possible.” In some cases, the share price is more important than the current profit and loss reports. In other words, the perception of value and long-term commitment is more important than the actual product or service that is provided. In my view, the profession has been complicit and silent in this massive shift that has taken place in the past 10 years. Academic and not-for-profit health centers are facing financial dilemmas when they try to carry out their missions. A way to solve this problem is to partner with industry. Industry has and can achieve efficiencies by integrating products, services, information systems, and analysis of outcomes. However, the dimensions of these partnerships, while providing short-term financial gain, may be a Faustian bargain with long-term unintended consequences on research, education, and patient care. In nephrology, many individual practitioners, academic centers, and nonprofit hospitals have sold their operations to companies publicly traded on Wall Street. Figure 2 shows the extent of that transfer in the dialysis industry over a short period of time. In the United States, dialysis units are being acquired at a cost of $40,000 to $60,000 per patient. If the share price on Wall Street drops or when some other challenge to reimbursement takes place, will the industry stay engaged or pull out, mimicking the savings and loan debacle? This would leave the responsibility for the patients to the government, public institutions, or individual physicians. Why are Wall Street and the dialysis providers interested in this enterprise in which capitated reimbursements dating back to the 1970s remain virtually unchanged? They are interested because of the opportunities to exploit advantages in the delivery of pharmaceuticals, to gain access to international markets, and to sell other products, including dialyzers, equipment, and nurse/technician services. After the consolidation phase is over, I believe that the dialysis providers, to stay in business, will need to control their major variable cost. This relates to physicians and their behavior. Thus, the ethical boundaries and realities of industry-nephrology relationships have become blurred. It should be emphasized that these tensions occur within the academic centers as well as the private sector. U.S. dialysis patient consolidation. Consolidation is expected to rise at a rapid rate. As an illustration of the influence of industry on physician behavior, let me use the simple example of erythropoietin, which has changed the lives and health of so many of our patients. Experience says that the way erythropoietin is reimbursed by the federal government drives the use patterns, rather than vice-versa. When it was less profitable for the providers to use more erythropoietin, the dosages were low despite suboptimal hematocrit levels. When it became profitable due to changes in the reimbursement policy to use more erythropoietin, increasing doses followed quickly. This was prescribing based not on the best medical practice, but on the reimbursement policy. In recent years, the profit margin of most dialysis units has depended largely on the negotiated cost for drugs, such as erythropoietin and, to a lesser extent, iron and vitamin D products, compared with the charges and reimbursement of these medications paid by insurers, patients, and the federal government. One could ask rhetorically: Since it is widely accepted that subcutaneous lower dose erythropoietin is equivalent to IV erythropoietin, why isn't this dosing route used for everyone? Why doesn't the government as the major payer for erythropoietin negotiate the price directly with the manufacturer? Since 1989, under regulations enacted by Congress as proposed by Congressman Pete Stark of California, there has been a ban on physicians referring patients to entities such as clinical laboratories in which physicians or their family members have an investment. Recent modifications to this legislation have extended that ban to a variety of designated health services for Medicare patients. Dialysis units are a specific, and in my view, logical exception under the Stark regulations. However, there has been increasing scrutiny by the Office of the Inspector General to determine whether this exception is being used to enhance physician compensation by tying the unit's medical director function to the volume of patients provided to a dialysis facility. In other words, are there payment pricing schemes being used via the Stark II exemption tied to the numbers of dialysis patients referred? To the extent that this is true, medical ethics and the law are seriously compromised. The precise job description of dialysis unit medical directors should be explicit and compensated reasonably but not excessively. There must also be accountability. A Renal Physicians Association (RPA)/ASN joint committee, chaired by George Aronoff, is working to define standards of practice in this area. Other major areas in which industry/nephrology relationships are particularly important are in professional education and research. It is clear that a well-educated profession, both in the content of nephrology as it evolves and in its application to specific patient problems, is in the best interests of both industry and the profession and, in particular, the patients we serve. How this education should be carried out is a matter of some debate and controversy. There are established guidelines for sponsorship of professional education activities from the American Medical Association as well as other professional societies mandating an arms-length relationship between sponsors of an educational event and the educational provider. Undermining this arms-length relationship destroys the credibility of the educational activity and is a threat to the integrity of the profession. There obviously is a legitimate need for industry to be able to display its products and advantages to physicians. On the other hand, excessive and unbalanced marketing can erode the trust between patients and doctors. All physicians, nephrologists included, believe that they themselves are beyond the influence of such marketing techniques; however, the objective data say otherwise. How can we as a profession and a professional society fulfill our obligation for balanced educational material and, most importantly, the processes of coming to unbiased clinical decisions in such a competitive milieu? The answers are not easy because there is a public demanding reassurance of professional competency by continuing education and no obvious funding source aside from industry partners. The following information should be considered by nephrologists when attending satellite educational activities at this meeting. All of the educational symposia in the evening at this meeting are CME-approved, and the speakers were approved by the ASN President for balance; however, they were planned by industry. Without making value judgments, they should be viewed critically by the audience. Ultimately, it is in the best interest of industry to have a well-educated, objective profession, because inferior products and slanted information sully the doctor-patient relationship and erode the ethical basis of medical practice. The area of nephrology research and its relationship to industry are also extremely important. Studies sponsored by industry with the goal of assessing safety and efficacy of a product are necessary and are best done with rigorous, clinical research methodology. However, we must realize that there is a proprietary interest that the product being studied is looked at in a favorable light. This puts intense pressure on investigators with implications for the publication of results. In the transplant area, in which competition among various new drugs is particularly intense, the recent study of Shah, First, and colleagues in Cincinnati is instructive (2). The adverse event profile of cyclosporine Neoral® versus traditional cyclosporine (Sandimmune®), both manufactured by the same company, clearly demonstrated no different efficacy and safety parameters in blinded studies versus open studies, where the newer drug was preferred. I think this pertains to most pharmaceuticals and reemphasizes the need for rigorous scientific scrutiny. Access of the investigator to all of the data for free publication is crucial if the proper relationship between industry and the profession is to be maintained. Investigators also need to examine the influence of non-financial perquisites obtained via their relationships with sponsors, such as support of their research infrastructure. Thus, academic institutions receiving indirect costs and investigators obtaining support and recognition in the form of publication and speaking engagements have a tremendous pressure placed on them in favor of a particular company or product. The profession and patients depend on accurate, unbiased information that should not be influenced by proprietary motives. The American Society of Nephrology decided to pursue a significant initiative to examine industry-nephrology professional relationships. A joint RPA/ASN Public Policy Forum was held on Sunday, November 7, 1999. This symposium addressed the issues from an ethical and practical standpoint as they affect physician compensation, medical education, and medical research at what seems to be a watershed time for our profession. A panel has been appointed by the American Society of Nephrology, chaired by Norman Levinsky, which includes experts on health care economics, ethics, and industry, to try to define current practices and recommendations for the proper relationships from an ethical and patient care standpoint between industry and the nephrology profession. If we lose the basic essence of clinical medicine, we will ultimately fail in our major mission, which is to act as the advocate for our patients and bring to them the compassion and technical skill that is necessary in the new world of science. An editorial from 1992 offers a description of the medical profession that aptly portrays the role of the nephrologist in the complex health care milieu of today: “The social contract of American medicine presupposes that physicians are patients' advocates, not advocates for society against patients whose care is costly or patients whose condition is such that physicians cannot be sure that procedures undertaken will have a high likelihood of long-term benefit” (3). The other major concern as we head into the 21st century is the alarming decline of physician-scientists in the United States. In December 1998, the American Society of Nephrology under the leadership of my predecessor, Wadi Suki, held a Renal Research Retreat at which more than 100 scientists from throughout the United States met to discuss research priorities for the next 5 to 10 years. There were eight working groups representing different areas of nephrology. Interestingly, in each group, workforce and training issues were identified as paramount in determining the success or failure of the proposed research initiatives. The decline of the M.D.-scientist is succinctly summarized in the recent Science article by Leon E. Rosenberg (4). It is clear that there has been a loss of a generation of physician-scientists committed to basic research on renal disease as well as a lack of suitable, well-trained individuals to lead the translation of exciting basic science into treatment of human disease. The final report of the American Society of Nephrology from the retreat has some specific suggestions for addressing these issues in nephrology. They include: upgrading salary stipends for M.D. research fellows so that they are financially attractive rather than punitive; continuing to work for mechanisms to ensure periods of secure grant support for young, promising investigators; changes in salary restrictions for senior investigators; and development of new mechanisms for facilitating interaction between M.D.s and basic scientists. With the impetus from ASN Councilor Norman Siegel and retreat members Joseph Bonventre and David Warnock, the ASN has introduced a new initiative to support 1-year laboratory training programs for medical students who are engaged in nephrology research. The program will start with five grants in 1999-2000. Financial support for the extra year of medical school will be covered by your Society. We believe that this program will increase and attract students to careers in kidney research at a young age and increase the number of research-motivated applicants to fellowship programs in nephrology. The ASN has also launched programs in medical schools for special interest groups in nephrology. This was the brainchild of the Women in Nephrology group and is cosponsored by the American Society of Nephrology. We are also working with our Government Relations staff and a new Government Relations Committee, chaired by President-Elect Tom Hostetter, on ways to reduce the debt of medical students and thus enhance the possibilities of a research career through debt repayment programs. The future of renal research rests on our ability to get the best people to go into research, because people are the major resource that we have for the next century. Quality nephrology fellowship applications have increased in recent years. We have 167 internal medicine and pediatric residents at this year's meeting experiencing the excitement of our discipline. Most importantly, we must maintain role models of enthusiastic physician-scientists (emphasis on physician) for our fellows and residents. This means countering trends in many academic departments where attending is done by generalists and hospitalists. I would like to conclude my remarks with some information about the 1999 ASN meeting and some recent ASN initiatives. The attendance at our meeting was more than 11,300 in 1999 compared to slightly over 10,000 in 1998. It is obvious that our scientific meeting by any criterion is a large success. The domestic versus foreign attendees continues to indicate that we are indeed a worldwide society. A comparison of 1998 and 1999 shows a continued trend toward slightly more foreign than U.S. abstracts. I would like to mention some of the highlights of 1999 Renal Week in addition to Dr. Coffman's excellent program. The Renal Pathology Society has been brought into the main part of the meeting, and their session on ANCA was excellent. Each year from now on the Renal Pathology Society will sponsor such a session. Taking into consideration the location of our meeting in 1999, the ASN organized a course in Spanish for nephrologists from the United States and Central and South America who are attending this meeting. The faculty included a mix of prominent U.S. and Latin American scientists and clinicians who are fluent in Spanish. An overflow crowd of 140 physicians attended. I would also like to recognize six Cuban nephrologists who have endured much hardship to be at the ASN Meeting. We had a strong course on vascular biology for our Basic Science Seminar and an advanced epidemiology workshop for our Clinical Science Seminar. The RPA/ASN practice guideline on initiation and withdrawal from dialysis was introduced at a free communication session on November 5. This work product is something that all nephrologists should use and take pride in, as it is an excellent document. Finally, I would like to call attention to the Women in Nephrology's professional development seminar for young faculty. This was an exciting session in which experts in medical education and mentorship shared their secrets with young faculty who are seeking the ideal way to plan their future careers. The 1999 ASN initiatives should be emphasized. The problem of chronic renal insufficiency is immense and one that the ASN, RPA, and NKF agree must be tackled in a major way. In addition to advocacy for an education project similar to those related to high BP and cholesterol, there was a summit held on chronic renal insufficiency in Washington, D.C., in May 1999. The meeting identified a need for better data and research in this area, since this problem affects approximately 13 million Americans. Certainly ESRF is just the tip of the iceberg. Efforts to hold a consensus conference, together with the NIH as a basis for such a Kidney Disease Education Project, are ongoing. Roland Blantz and John Stokes, from the ASN Council, have been particularly active in this area. Under the leadership of Craig Tisher and Kirsten Madsen, the Journal of the American Society of Nephrology continues to achieve an impact factor that is better than Kidney International, a remarkable feat in a short period of time. Their hard work has made the Journal an excellent source for the best in renal science, both basic and clinical. We have a new Transplant Advisory Committee chaired by Mohammed Sayegh. This committee has provided input to the Council regarding issues of postgraduate education and research and practice in transplantation. They have completed their first project concerning the implications of new organ allocation systems on kidney transplantation. I am proud to announce that the ASN has hired a full-time postgraduate education director. Dr. Robert Narins has joined the ASN in this capacity. He has been largely responsible on a part-time basis for our spectacular growth in postgraduate education. With his full-time efforts, I think there are exciting things on the horizon. Lastly, the expansion of the ASN's direct research portfolio is something that we can all be proud of. This year we plan to award almost $1 million in direct research grants through our peer review process. I hope you have an enjoyable and profitable experience at the 1999 ASN Meeting. I would like to thank some of the individuals who have been inspirations and role models for my career in nephrology. They include Takeshi Andoh, Emmanuel Burdmann, William Couser, Jared Grantham, Priscilla Kincaid-Smith, David McCarron, Robert Narins, George Porter, Robert Schrier, and Norman Simon. Without them, I certainly would not be here addressing you today. I thank Dr. Alan R. Hull, Dr. George R. Aronoff, Dr. Theodore I. Steinman, and Dr. Brian J. G. Pereira for critically reading the presidential address and providing data and useful comments.